CLEARS, Inc. is a not-for-profit professional organization dedicated to providing training in the technical and legal aspects of law enforcement records. CLEARS, Inc. provides networking capabilities to its members and associates who are comprised from more than 500 law enforcement and other criminal justice agencies within California. The mission of CLEARS, Inc. is to develop to its maximum potential and to become a complete resource to its members. Being proactive and using today's technology in the current law enforcement arena, records personnel are kept up-to-date with announcements from all Chapters, provided upcoming training dates, keeping agencies aware of changes in legislation, providing membership information and documents for downloading. The governing Board and Committee positions are explained that any active CLEARS, Inc. member may pursue for career enhancement, as well as job announcements. By staying in communication with your Records colleagues statewide, lots of changes that can impact the future for civilians in law enforcement will be noticed. Salary surveys, training requests and seminar training information will also be found here. All of these areas are key for participation and allowing the state to compile thorough documentation for helping to increase the overall equality of today's Records Managers in the "Information Age." 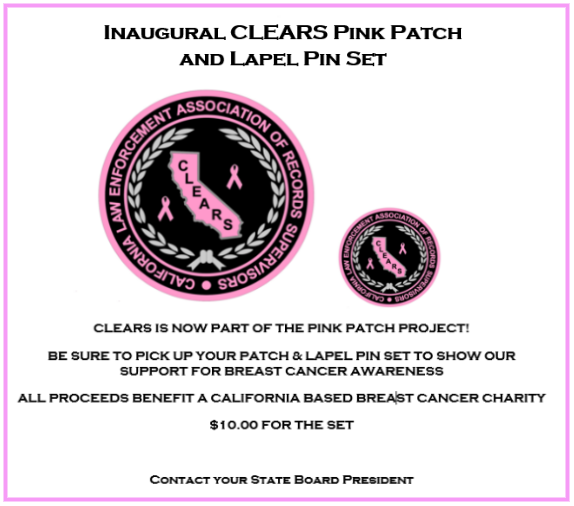 CLEARS State Challenge Coin - Makes a great gift for anyone in Records and those who support Records... Only $5.00 each. Contact Northern Chapter President for ordering.